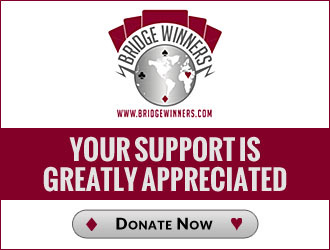 Magic the Gathering champ also plays bridge! Should the WBF continue to be headquartered in Lausanne, Switzerland? The WBL, the EBL, and the ACBL -- Oh, My! Response to comments of John Vos on "parochialism" of Bridge Winners and the U.S.
Have "many people" made "gratuitous slurs" about the Polish team? No, they have not. Has the World Bridge Federation put up an Iron Curtain? Report in the Friday Bulletin in Chennai about the Review requested by England: "Late Night in Chennai"
Is eradicating cheating a top priority of the World Bridge Federation? How can an Open KO be canceled at a Regional?